Women's Gardener Clogs is rated 4.3 out of 5 by 63. Zapato sin cierres hecho a mano con goma impermeable, diseñado para la jardinería. El zueco tiene una forma natural y flexible hecha de goma y además cuenta con la firma de Hunter en el dibujo de la suela para un mejor agarre. Forrado de neopreno, protege de los elementos a la vez que proporciona sujeción al pie. Rated 5 out of 5 by Pmtram from Women’s Garden boots Love these boots. Very comfortable and study. Great to wear while gardening or shopping. Rated 5 out of 5 by JoyceK from Pretty terrific! 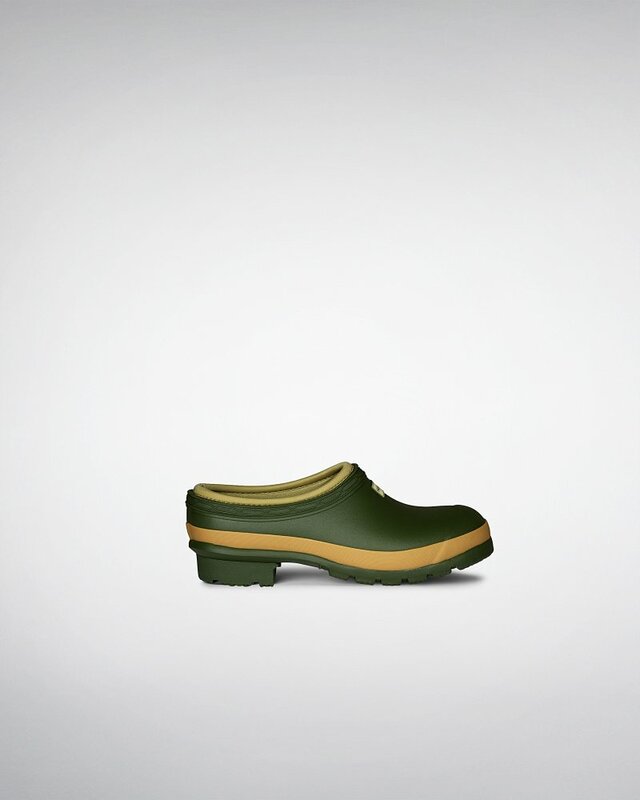 I first saw these 'Gardener Clogs' when I was in England about a month ago. As the garden center was very busy and I wasn't able to find a clerk to help me, I decided to order them direct. Lo and Behold they came in a couple of other colors than the one green shade that I had seen at the store. I chose the 'Dulse' which is a sort of maroon color with a sagey-green trim and I love them! As I live in the northeast of the U.S. our weather can be unpredictable. These are perfect for those days of rain, slush or a little snow squall, when you might not want to pull on a full boot just to run to the store or lunch or whatever. Very cute with jeans and VERY comfortable. My first day wearing them I was able to leave them on all day and my feet never felt sweaty or uncomfortable. Highly recommend! Rated 4 out of 5 by kleekel333 from Heels slip out I bought these and actually like them very much. The only issue I have is that my heels slip. Not sure why but it is bothersome. I wish the heels were just a tad higher and maybe they wouldn't slip so much. Rated 5 out of 5 by Marcia from Great for airport travel I travel for work and have TSA pre-check at the airport. There is no metal in these clogs, so you do not have to remove them when going thru security at the airport. They are also very comfortable when walking on hard and slipper surfaces. Warm too! Would like to see more colors available. Rated 5 out of 5 by MorganT from Wonderful Shoe Excited to receive these shoes as a gift for my mom. She is a huge Hunter fan and loved this for casual wear as well as wearing for outdoor work. Rated 5 out of 5 by Garden19 from Great features! Exceptionally comfortable and waterproof for working in the garden or walking the dogs. Very happy with this purchase. Rated 5 out of 5 by Jsmls from Simply great boots True to size, great fit- wonderful for all year gardening.